Hi. How are you guys? Everything is fine at the house, but Martin misses you so much. Sometimes when he’s saying, “Mommy is coming back another day,” that’s when a tantrum starts. I thought that was a very clever sentence. But he was really serious about it. Then he remembered that you aren’t here, either, and he related you to the saxophone and things got worse. He started to cry even more. So I took him to the toy store to look for something similar to the saxophone. Well, he saw a trumpet and got that into his head and didn’t want to think about anything else. I was going to buy it right at that moment, when I realized that I didn’t have my wallet in the backpack and—oh boy! He cried so much. He couldn’t understand that we were coming right back to pay for the trumpet. He cried all the way back to the house and until he saw my wallet, when he finally understood that I was not kidding. Later he was the happiest boy with his trumpet, and then he got another present from your mother and he was more happy still. Ugh. Martin has not obsessed about a musical instrument (he used to carry one everywhere) in months. Is emotional distress causing bygone habits to reemerge? Emotional distress because I am not there? I’m craving my little man, craving his presence. I have eleven close girlfriends from my high-school class. “The twelve,” we call ourselves. We’ve had bumps in the road, big ones, and yet 21 years after graduation, we’re more or less intact. And when it comes to Martin, these friends have joined the struggle in ways I could have not imagined. It was a high-school girlfriend, an EI practitioner, who first identified Martin’s disorder as autism and got us started in the road to intervention and recovery. It was another, a chef, who recently came to stay two weeks with us when Martin started eating meat, to prepare his special meals. It is others who read this blog, who offer listening ears, who email regularly just to ask how he’s doing. That must have sounded strange to my friend, who knows me as a long-time vegetarian. Probably it sounds strange also to anyone who doesn’t know that, in the semi-rural area where I grew up, people hunt. A lot. Before I became a vegetarian at age 16, I ate venison by the pound. It’s so lean and protein-dense, just what we’re seeking for Martin these days. It’s also difficult to procure, in Manhattan. My friend responded that getting venison might be tough; the economic climate right now means most folks eat all of what they shoot. I know, I said. No expectations. Let me see what I can do, she wrote. A couple weeks passed. I’d nearly forgotten the request when this friend’s chat box appeared on Facebook again, to say she had venison for me, stored in the freezer on her family’s farm. As luck would have it, one of my brothers happened to be visiting our hometown last week, and then coming down to New York City on Monday to help my mother with Martin while we travel. I dispatched this brother to meet my friend and retrieve the venison, which now is snug and secure in my freezer. 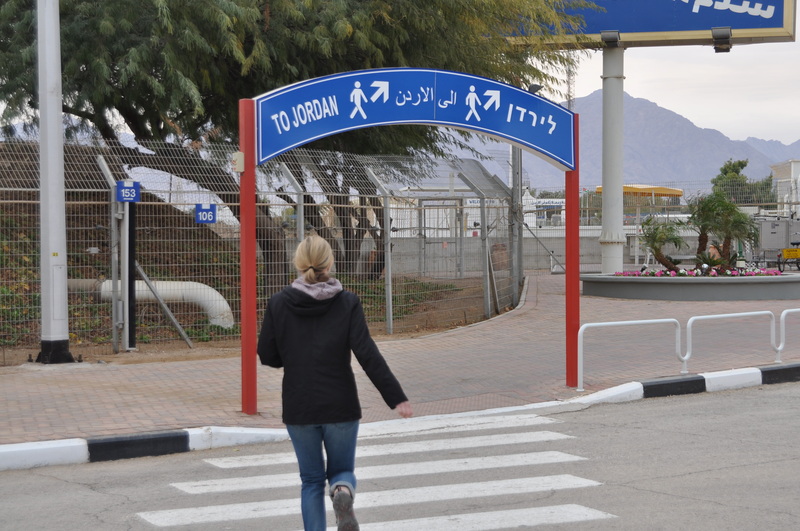 Your blogger, headed from Israel into the Kingdom of Jordan. 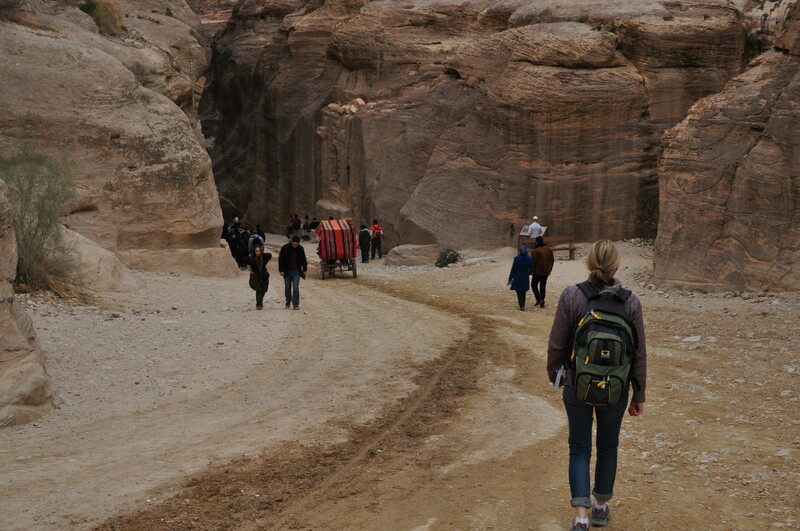 Your blogger, descending to the ruins at Petra, Kingdom of Jordan. And thinking about Martin. I don’t, at this moment, have fears for myself. I have fears only for Martin. That’s not to say that I don’t worry about dying. Or, you know, a horrible disease or coma-inducing accident, or terrorist attack, home intruder, flesh-eating bacteria, mountain-lion bites, impalement. The usual. I do worry about all those things. But my fears for myself have taken a backseat. A distant backseat. Way back, like at the swaying end of a double-length bus. As I recited my pre-take-off prayer last night, I had a feeling like, “If it’s my time to go, it’s my time. Martin is the only grandchild of my mother and stepfather. I know they would step in without hesitation and continue his biomedical recovery. And they’re not alone. My father, my siblings, my parents-in-law, my brother- and sisters-in-law. Any one of them, or all of them. They’d have a lot to learn, but they’d do it. Then again, deep-down I wonder: How could anyone do what Adrian and I are doing for Martin? More accurately—and I’ve admitted: I’m a control-freak—: How could anyone do it to my exact specifications? The countless pills and liquids, the fifteen HANDLE exercises daily, the RDI, the Track Two doctor visits across the country. The faith and determination. If something happened to me, would Martin still be able to reach his potential for recovery? That’s it, then. In my whole life right now, the thing that matters most (maybe the only thing that matters?) is my son’s recovery. My pre-flight prayer now is simply that I stick around to see it through. To own the truth, I’ve long been a person with a cause. Usually the cause involves animals, like ending the carriage-horse industry, regulating backyard breeding operations, or banning battery cages. But I’ve never been a person who took enough action for her cause. I give money. I speak out when asked. I hope and wish. I don’t do. At least, not until now. My cause now is Martin, and I’m doing. Damn it, I’m doing. Okay. The object is my son, and therefore this particular cause is just one step removed from pure selfishness. Moreover, it can (I trust) be accomplished entirely. I can recover my son. I can make him indistinguishable from his neurotypical peers. That fact alone separates Martin’s recovery from, say, world peace, or eradicating poverty and disease. Still, it’s a cause, and for the first time ever, truly I’m stepping up. Once Martin is recovered, what’s next? I have a sense that this episode could herald a new chapter in my life, one of doing instead of hoping and wishing. Maybe my cause will be promoting biomedical recovery, or defending practitioners like Dr. Usman who devote themselves to recovering children. Maybe I will stick to animal welfare, with the new perspective of having felt compelled to feed my son meat as part of his recovery. Some years ago, when I was considering a career change, a friend told me to remember that a life is many decades long, meaning that what seems earth-shattering at one moment may in time reveal itself as only a bump in the road. Not to be fatalistic (just contemplative), I’ve had four decades already. If I can recover my son, I will consider them well-used—even if, in time, this journey comes to seem only a bump in the road. As for Martin, our efforts now will give him many decades in which to do whatever he wants, free from the grasp of autism. 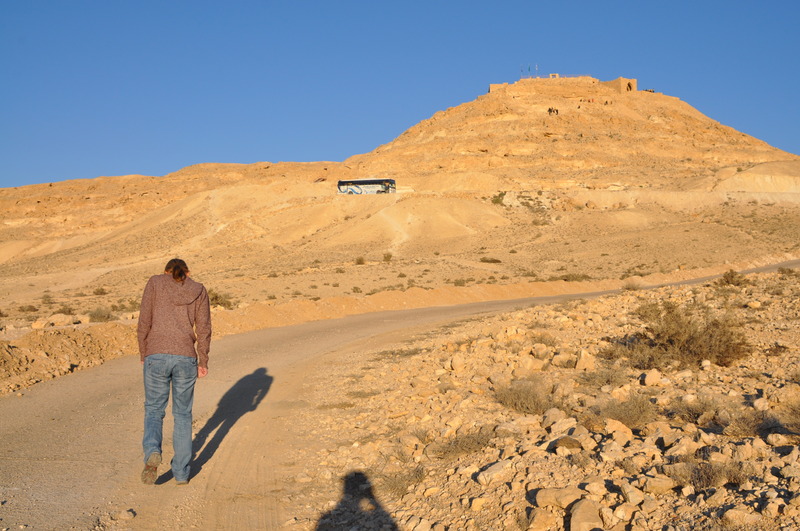 Your blogger, hiking to the ruins at Avdat, southern Israel. Readers, it’s been a week. 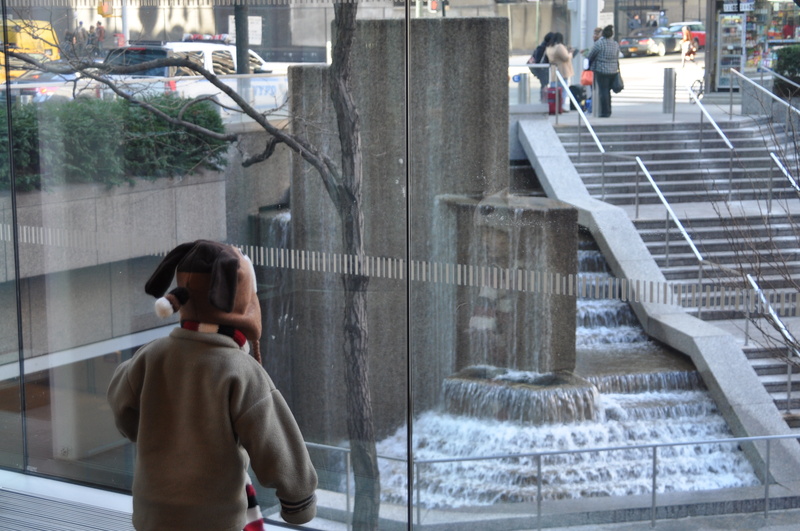 For the first time since I started this blog, I let more than three days pass without a post. I blame Christmas preparations—I didn’t accomplish even half a standard Christmas, but that’s a subject for a later post—, forging through dense briefing schedules in two separate litigations, sitting up at night as Martin’s had trouble sleeping, and preparing for the trip. I’m worried, of course. Not that my mother won’t accomplish Martin’s diet and supplements to the T. Not that my mother and Samara and even my visiting brother won’t be doting on him. I’m worried that he will be distressed without us, and more especially, that we could lose recovery momentum. These past few weeks have brought so much progress. I’ll have a hard time forgiving myself if our absence interrupts that, or prompts a set-back. Nevertheless, I made it out the door, teary-eyed. I’m typing this on the airplane. We’re bound for Israel, landing in Tel Aviv and continuing by car to Eilat, then to Jerusalem, sandwiching a day trip to Petra in Jordan. This was all supposed to be a surprise, but some weeks ago I forced Adrian to reveal the itinerary. Not knowing our destination was just shoveling anxiety onto my already gigantic pile of hesitation about leaving Martin. It’s only the second time, since we radicalized his treatment, that I’ve been away more than a night. The first was a four-day trip to Germany for a family emergency, during which Samara moved into the apartment and helped Adrian manage the routine. So there you have it. 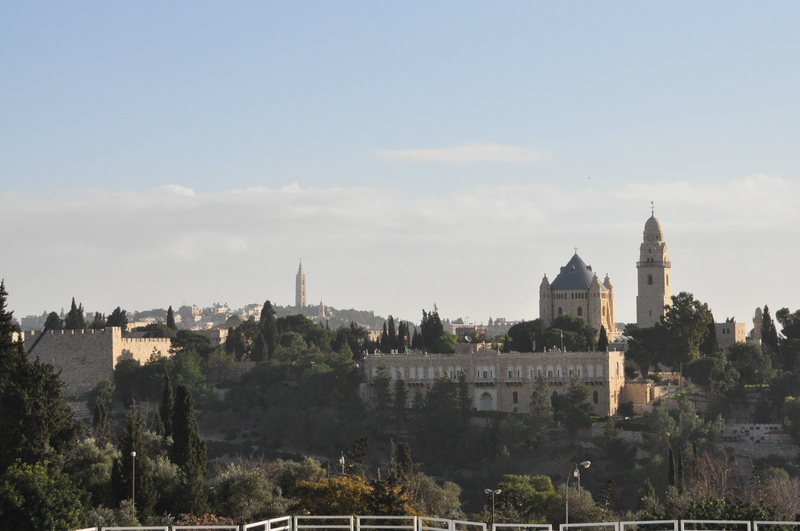 This blogger is on her way to the Holy Land and will have a week to contemplate the course we’re on with Martin. I’m determined to post daily, both to take advantage of the time away and to make amends for the recent posting dearth. An eight-day travel journey, meant as a break from a years-long recovery journey.